"Six plus 25,'' reiterated Armstrong. Houston had calculated that they could expect the engine to start throttling 6 minutes 25 seconds into the descent. 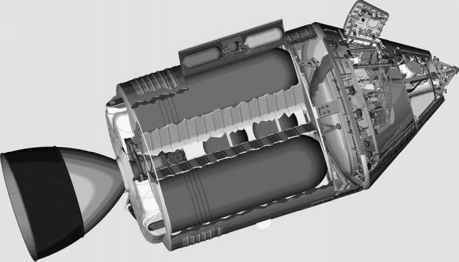 Designers had been clever in providing a technique that solved the engine's inability to throttle smoothly through its high thrust settings. They arranged that P63 should compute a course to a spot 4.5 kilometres short of the landing site and, strangely enough, half of a kilometre below the surface. This profile had been chosen to achieve two goals. First, it called for an initial thrust level that was higher than the engine could achieve, to which the engine responded with its constant high thrust setting - that is, 92.5 per cent of maximum. For about 6.5 minutes of the burn, the spacecraft continued to lose speed and gently arc towards the surface until the thrust required by the computer fell below 57 per cent of maximum. This was the second goal behind the choice of profile because at that point, and for the remaining 2.5 minutes of P63's work, the engine's thrust jumped into its throttle range, which lay between 65 and 10 per cent of maximum. ''Wow! Throttle down,'' called Aldrin, joyfully. ''Throttle down on time,'' said Armstrong. ''You can feel it in here when it throttles down,'' noted Aldrin. ''Better than the simulator.'' The crews had intensively simulated the descent, but the one thing the simulators could not provide was the g-force provided by the engine. Now that the computer had control of the throttle, it could adjust it to drive the spacecraft's trajectory towards an optimal flight path.